Yes The Winds Are From The North But Why So Strong ? Really !!! Yes the winds were from the north which was a welcome relief from the previous day’s wind direction that was directly in my face. When I am using my sail and starting out I usually put a double reef in the sail unless the winds are really light. I am a firm believer in the concept of reefing early and reefing a lot. This morning the winds were blowing pretty good so I left the double reef in and found I was making pretty good speed without a lot of sail adjusting. I started to have thoughts of “Hey, maybe this event is going to be fun after all. Yesterday was a pain day and now I am going to have the winds at my back the rest of the event. That has happened in past years why not this year?” Oh how foolish!!! Blackburn Bridge is a swing bridge that is at the end of Little Sarasota Bay and allows folks to get on to Casey Key. This bridge is a low one and required me to either drop my mast or request a bridge opening. Since most bridges have a fixed time schedule when you can request an opening, I don’t like to waste time waiting for a bridge opening. This means I have had to develop the ability to lower and raise my mast while still in my boat. As I approached the bridge I saw another Watertriber beached next to the bridge so I decided to go ahead and pay him a visit. I needed to take a “biological break” anyway. In other words, I needed to go to the bathroom. As I pulled my boat up I noticed that this Watertriber had his hand wrapped. Turns out he had busted his oar lock and in the process of repairing the oar lock he had cut his hand. Apparently it was a bad cut and he felt it needed stitches. He was trying to decided whether to try and get someone to take him to a clinic now or wait until he got to CP1. This is another situation I wonder how many rookies think about when entering one of these events. Knowing first aid is important but having the ability to look at a wound on your own body and treat it without freaking out or passing out is very important. If you are alone, which is most of the time, it is all up to you to doctor yourself. This Watertriber had done just that and now was in problem solving mode for the long haul. Nothing I could do so I took down my mast, got under the bridge, and then put my mast and sail back up. As I continued south the winds kept getting stronger and started making it tough to de-power my sail. I couldn’t reef any more sail so I was left with trying to dump the wind out of the sail. This worked while I was in the ditch around Venice but once I cleared the ditch things started to get a little out of control. At one point I had to let the sail out completely which must have looked strange from the shore. Here comes this vessel with the trailing edge, not the leading edge, of the sail leading the way. This just wasn’t going to work so I beached to take my sail down and put up my smaller PAS sail. I had mentioned in my previous post about veterans giving tips while on the launch beach. Well, a Watertriber who goes by the tribe name Whitecaps had dropped two suggestions to me at the start that I didn’t pick up on and boy did I pay the price. This was the first one. While on the beach he suggested that I go ahead and assemble my PAS sail and just leave it on the deck stowed. I was worried about having too much stuff on my deck so I didn’t do it. Well as I am assembling my PAS sail a big gust of wind hit me and the partially assembled sail. This in turn created a mild level of chaos with the sail flapping, my boat starting to drift, and knocking a shackle pin out of my hand. Funny how sometimes things go into slow motion. I watched this shackle pin slowly fly through the air with my hand trying to catch up and ultimately dropping into the water. %$#&*—–$%#*&&——%$#@&. Gee, I though I left those words on the last merchant vessel I was on. One of the things you learn in these events is that stuff happens and getting pissed off and mad doesn’t solve anything. Might make you feel better in the short run but it doesn’t solve the problem. After thinking about it I found I could hold the sail together with my hands and set it in my lap in the cockpit. This allowed the sail to act as a downwind sail and I could control it with my hands. The critical issue to the success of this solution would be could I hold this sail for four plus hours to get to CP1. Lucky for me I was able to do just that. 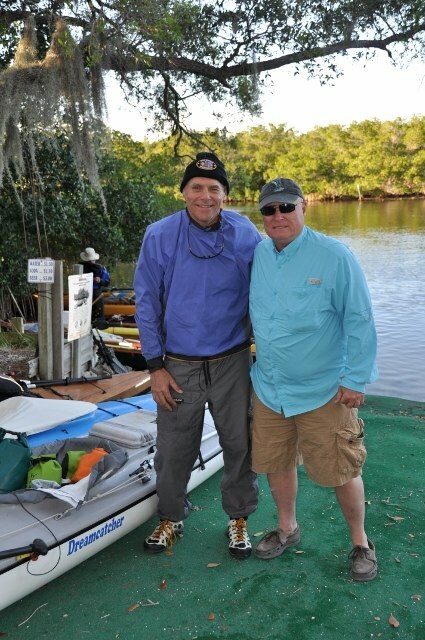 This is a video of me at CP1 that Bob Howell (the guy in the light blue shirt) made. You will notice that I am rubbing my hands trying to get the blood circulating in them and hopefully make them feel better. On arriving at CP1 I was shocked to see Jungle Jim. As I indicate in my post about the start, Jungle Jim is just plain silly fast. Steam comes off his wake but here he was at CP1. Then I saw Salty Frog. He is another one who is just plain silly fast. As I started to walk around CP1 I ran into more and more Watertribers who were just hanging out at CP1 due to the weather. Apparently a very experienced and seasoned kayaker had left a couple hours earlier and had tried to cross Boca Grande Pass. Apparently it was so rough that he was swamped, ended up not being able to self rescue and swam with his boat to a small island. In his call to CP1 he indicated that the swim wasn’t bad and that he was going to spend the night at the island to see if things would calm down. 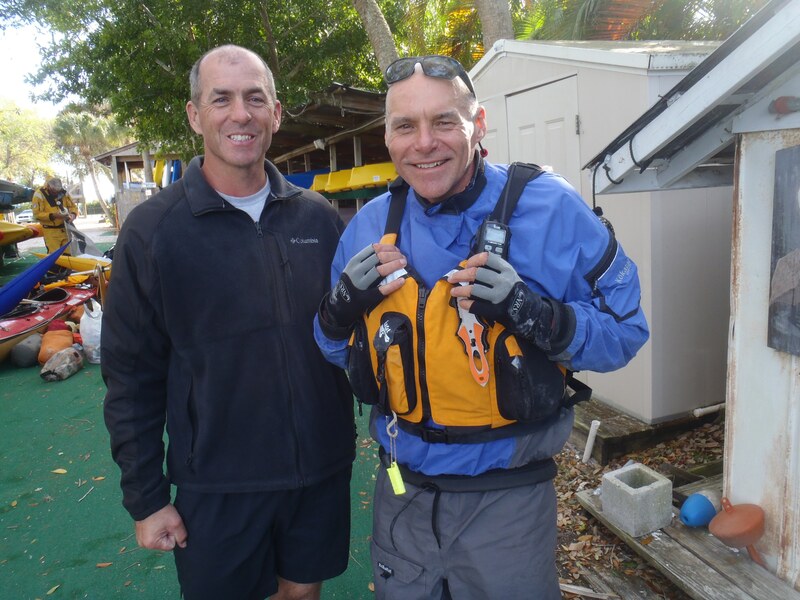 Since it was still daylight when I got into CP1 I did have thoughts of just checking in at CP1, filling up my water bottles and pressing on , which meant crossing Boca Grande Pass ( I don’t like this pass at all). 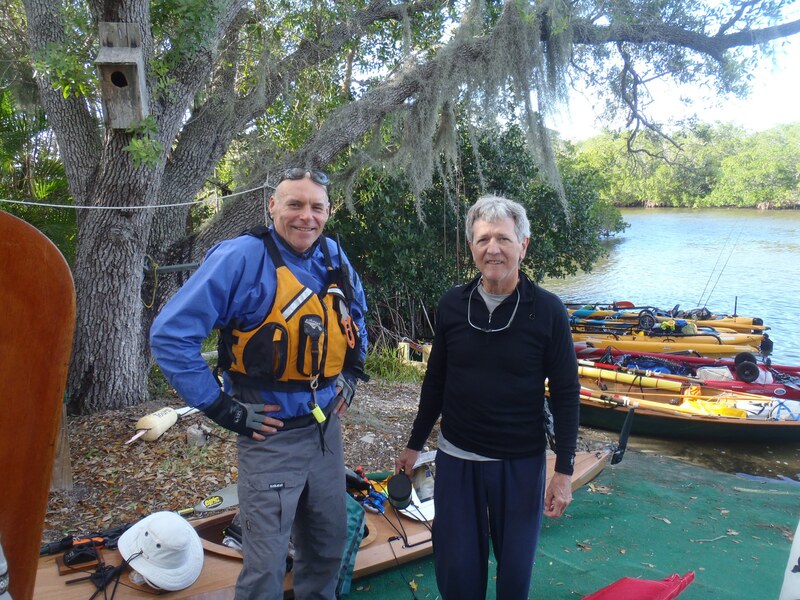 After talking to a couple of folks, seeing that there were hot dogs, potato salad, and baked beans at CP1, and did I mention I didn’t like Boca Grande Pass, I decided that I was going to join the club and let the weather settle down some. Now all I had to do was find a spot to set up camp that would be a little quiet. I hate to say it, but I think you have to snore like a bear to be a Watertriber because everyone seems to do it.